I just finished reading James Wagner Au’s post about the new OnRez browser form the Electric Sheep Company, he got a little demo from ESC when he was at the Virtual Worlds Expo. He was worried that the OnRez browser would AOL-ize the Second Life experience, because the build button was gone and some other changes they had made to make it easier to use. Of course, that post was just from some screenshots they had sent him, he had not seen the browser itself yet. In a follow up post, Worldwide World: OnRez integrates Web browsing into metaverse experience, is where he got to see and use the OnRez browser in Second Life and he gives a little mini review/thumbs up. Anyway, back to the AOL-ize statement, if you ask me, this is exactly what Second Life needs, an AOL version that is very simple to use and easier to get around Second Life with. With the Herald proclaiming that Orientation Island has been broke for months and is trapping new residents, why wouldn’t the whole grid want to make it easier for the “normal people” to go inworld? The more people in Second Life actually using the program, the bigger the grid gets, the more money people will make, the more people in the more people to pull people in, it’s a snowball affect. 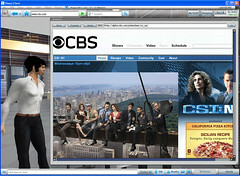 With the upcoming CSI: NY they have the possibility of pulling millions of new residents in, if it is easy for them to use, they will recommend it to their friends and try to get them to go inworld, and it will just keep getting bigger. I can understand what he is saying about people not being able to see the build button, or it’s harder for them to get started, but, come on, we need more people in Second Life, we need it to get bigger, and while people are signing up, if they can’t get out of OI, then they will never come back. With the OnRez browser, Second Life will have a better shot at keeping this users and getting them to actually login again and again. If you look at virtual worlds, they will develop much like the web did, the creators come first, and the followers come next, some will create, some will never create, but they all still use it. With Second Life, it’s a lot harder to get started, so users move on quickly, with the OnRez client being more like a browser, these new users are already going to be more comfortable than they are with the default SL client. James mentions one thing he likes a lot, and that is the address bar, you can enter Second Life locations and teleport straight there, if you enter a keyword, it will give you a list of possible matches to choose from, if you enter a web address, a browser will open in the OnRez browser, instead of an external window, and take you too that webpage. If you have one monitor, this will probably be a godsend, as you won’t have to minimize SL to do anything else, people like me with two or more monitors will probably continue using the external browser to do web stuff while in SL. By integrating HTML addresses and virtual locations into the same navigation interface, the OnRez version of Second Life effectively swallows the Web. Some qualifications from Forseti (Giff Constable): the browser within OnRez isn’t yet fully-featured; it doesn’t run Flash or some other key plug-ins, for instance. (I found that out after I entered YouTube.com into the OnRez address window, and got sound, but no video.) Giff says they’re planning on incorporating those in later versions, but then, there’s another catch: while the OnRez viewer is an outgrowth of Linden Lab’s open source initiative, OnRez itself is close sourced, created with a special commercial license the Sheep received from Linden. Not necessarily a bad thing, of course, and Giff tells me they plan to open source some of the OnRez features, but that may slow its evolution as a fully functioning operating system. I myself can’t wait to try it out, although I have a feeling I will continue using the default client, if the OnRez browser is not as resource intensive, it will be great for those situations when you have a PC that may not be the best to login to Second Life with. Plus, I can try to get more people to try it out, hopefully without having to explain as much as you normally each and every time you help someone get started. As I mentioned earlier, you can go to http://viewer.onrez.com/ and signup for notifications of when the browser will be released. Added: For some reason wordpress wouldn’t let me leave a comment on my own blog, so I am just adding my reply to prokofy’s comment below. I read both of the posts that you link too, and while you have a couple good points on how they could instantly become the SL Google with this new browser and the new users that they send, I believe I will wait until I ACTUALLY TRY IT FIRST prof, unlike you, I am not going to get all bent out of shape on the word from others without trying it out for myself. If it shakes out anything like online search, then the best search engine will win anyway, and if they exclude the Second Life search, one would think it would be easy for the Lindens to ban the Sheeps spider grid wide, and you know that wouldn’t be good for ESC. There will have to be some give and take, so instead of getting my blood pressure all worked up as you are, I will wait until they actually release and go through the whole setup process for myself before I pass judgement. Thanks for stopping by Prof.
You really need to ask a lot more questions about this. This viewer doesn’t just take out BUILD — which I’m all for, I’m happy to have BUILD removed to and make it optional, my God, only 10 percent of the people really BUILD on SL! — but I’m not for one company taking over the view of the SEARCH. There are some troubling implications here. According to the chat I’ve had with OnRez technical support (after my 3rd crash), it’s not advisable to use the in-game browser for any https access right now -> it’s got a rather large security flaw right now. There’s also a nice hacked version of the OnRez client starting to do the rounds that lets you have the ‘Shop’ button open any url of your choice … nice if you like the viewer, but find the OnRez experience mind-numbingly snow.